Homeless in the East Midlands has risen by 72 per cent since 2010. This week the Chad reveals the true extent of homelessess and rough sleeping in the Mansfield area. As part of our continuing series of reports on the rise in local poverty, it emerges that at least 100 people couldn’t find a bed or shelter in the past few months despite council emergency funds and volunteer services available. Today marks the official closure of Framework's important homelessness prevention services in Mansfield. After drastic funding cuts, the charity, which provides shelter as well as a number of other services, has had to withdraw its prevention support from all areas outside Nottingham. Councillor Tom Hollis helps volunteers serve hot food to the 30-40 people who are now attending a soup kitchen most nights of the week. And as the community was rocked by the news that the East Midlands had a 72-per-cent rise in rough sleeping since 2010, it couldn't have come at a worse time. Now charity leaders and local volunteers fear homelessness is about to get significantly more common. Official statistics placed Mansfield's homelessness levels relatively low - at only eight people per night without shelter - and as we take a closer look at local poverty the Chad can reveal the massive discrepancy between what the council calls homelessness, and the reality of what people are experiencing on the street. Someone is defined as homeless only when all other options for them have been exhausted, and no more support can be given to get them into housing - hence why the number is so low. But having talked to those who help homeless people every day, the real extent of people sleeping rough with nowhere else to go is much higher. Mansfield Soup Kitchen says at least 100 new homeless people have sought shelter in the past five months, as they come to them looking for a tent or a sleeping bag. Some 30-40 people - the vast majority of whom are sleeping rough - come to them each week for a hot meal, a food parcel, toiletries, clothes and often a sleeping bag to keep them warm. And they say the numbers are increasing each week. A leader at Mansfield Soup Kitchen, Maria Gibson, tells: “Genuinely homeless people without shelter come to us and ask for sleeping bags and tents and basically want somewhere to sleep. Since November we’ve given out 100 tents. That’s four to five new people each week who want shelter and can’t find it. “Many have got a history of debt and non-payment of rent so they can’t get into council houses. And there's a massive input of immigration, with non-English speakers who want food but they can't get benefits." But the government doesn't call these people 'unintentionally homeless', and so the difference between the officially recognised number and those who are sleeping rough, and only deemed 'intentionaly' homeless, is huge, and Maria, 50, says the issue is only going to get worse as cuts to council and charity funding is driving more services to close. 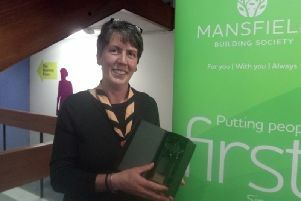 More than 120 people slept under the stars in Mansfield on Friday night (March 25) at the Mansfield FC One Call stadium. Mansfield's homelessness prevention strategy for 2013-18 stated that some 1,100 households approached the council claiming homelessness in a year. Last year, the council said they helped 113 households which had been made genuinely, 'unintentionally homeless'. Meanwhile hundreds more are kept afloat by council and charity services aimed at keeping them in their own homes and helping to provide access to benefits, alternative housing and other support. Framework kept 855 people across Nottinghamshire out of homeless in the past year - more than half the people it has contact with. But as Nottinghamshire County Council has slashed their funding from £2.6 million in 2013 to £1 million, the charity has been forced to close down all of its homelessness prevention services outside Nottingham completely. Now the number of users is stagnating by hundreds over the past few months as the charity has prepared to suffer the cut in service. Chief Executive of the sheltering charity Framework Andrew Redfern comments: “Effective prevention also saves money for the health, police and crime commissioners. We tried to save these crucial services by asking everyone who benefits to make a small contribution. Sadly, they were unable to pool their resources in this way. We just couldn’t make it happen. “We developed these services over a long time, and the staff now have years of experience. I am troubled at the thought of this knowledge and experience being jettisoned for short-term financial gain – when the long-term consequences and costs are all too predictable. While the savings may be necessary, the cost they create down the road will be huge, adds Maria. Mansfield Big Snorers raised more than 20,000 to support towns homeless in a sleep-out last week. “The main national charities have had all their funding cut, so there’s no national charity back up and that homeless situation now is being purely dealt with by public generosity." Liberal Democrat County Councillor for Ashfield, Tom Hollis is an ardent supporter of the Soup Kitchen and helps to hand out the 30-odd meals to homeless and needy people that come by each week. He says: “I viciously oppose what Labour are doing at the county council, they cut funding to voluntary organisations like Framework. The reason it’s bonkers is because the council has a statutory role to provide shelter and safety - they can’t leave people on the street once they’ve been approached, so by taking away that money council, it comes back round to cost the council more in the long run. Mansfield District Council says: "Every year local authorities are required by central Government to carry out an estimate of rough sleepers in their area on a typical night. In November 2015, Mansfield provided an estimate of eight people sleeping rough. This estimate was produced in partnership with The Beacon project, local faith groups, probation and street wardens. It was then independently verified by Homeless Link before being submitted. "From April 2015 till March 2016, Mansfield District Council accepted a duty to house 113 households who were “unintentionally homeless”. This could include victims of domestic violence, people with mental health problems or people who have been evicted from their home due to mortgage repossession. "The council has 43 units of temporary accommodation for people where an interim duty to accommodate a homeless and the average length of time in this accommodation is 10 weeks before being rehoused. "In Mansfield there are several voluntary groups providing soup, sandwiches, hot meals and access to showers and clean clothing every day Monday – Friday. Soup kitchens and food banks provide assistance predominately to those on low incomes who may or may not be homeless." And like most things, there is a seasonal nature to homelessness. Of course in the coldest weather people are sleeping rough are in the most danger, and the council works with Stonham Housing, Transforming Notts Together, Mansfield Baptist Church and individual volunteers to provide shelter in severe weather. Between 4 December 2015 until 29 February 2016 (weekends only) they provided shelter for 34 rough sleepers. MDC added: "Not all of these people had a local connection to Mansfield and were there were therefore not eligible to secure access to accommodation or assistance from the council. "As well as a hot evening meal and breakfast, the council hosted drop-in sessions for rough sleepers at Stonecross Court. The primary aim of these was to engage rough sleepers with health and other agencies. One of the issues identified was the condition of rough sleepers’ feet. Using money that has been donated to the shelter, the council has provided new socks each week. Cllr Barry Answer, Portfolio Holder for Housing, says: “As Portfolio Holder I have personally visited every soup kitchen and hostel to ensure that I am aware and engaged with the most vulnerable people in our district. We provide an enhanced prevention service to ensure that we work with people to prevent them becoming homeless and I am pleased with our success at achieving such high success rates. “I am confident that the homeless service works very hard with the homeless when they require assistance. We always encourage everyone who is threatened with homelessness to seek help early on. “We do rely on an individual to make contact with us to access the services. Unfortunately the council cannot help everyone – but its priority is to help those in most need and will work with everyone to try to access suitable accommodation." MDC’s Director of Communities Hayley Barsby adds: “The council is focused on working in partnership with the voluntary sector to provide services to those in need. The provision and support offered by the soup kitchens and food banks in Mansfield provide valuable support to those people and families who are on low incomes. Some of these people may be classed as homeless but the majority are utilising these services due to low income and are suitable accommodated. David Pearson, Corporate Director for Adult Social Care and Health at Nottinghamshire County Council, said: “The County Council is continuing to allocate almost £1m to Framework from this April to support services in four quick access homeless hostels across the county. “The Council has had to prioritise our statutory services – those we must do – over discretionary services such as homeless support services. “The floating support service provided by Framework, which targets people still in their own homes but identified as being at risk of homelessness, will cease from April 2016. “District and Borough Councils have the legal responsibility for homelessness and are working with us and Framework to identify alternative sources of support for affected service users. Chris North, 23, is a father of two. Only a young dad, he strived to provide an income for his family, finding his first monthly paid job and without the ability to manage his finances, failed to keep a check on a casual gambling habit. He received an eviction letter form his landlord when he got into arrears, and giving him a 28-day ultimatum, it served as a huge wake-up call, so he turned to Framework for help. Chris owed over £1,300 in rent arrears, an un-affordable level of debt for him to pay up-front. Due to the response of Mansfield HPS (homelessness prevention services) provided by Framework, the family of four were able to stay together and in their home. Framework HPS is to cease services in Mansfield completely from April 1.